DAV Model School, IIT. Kharagpur had conducted a SKYPE session with the European school, EUROPAIDEIA. It’s a school of foreign languages in Athens ,Greece,. Ms. Chandni Wadhwani, Education USA Advisor, USIEF Kolkata was the Resource Person who took the session. Mrs. Anita Bhattacharjee (PGT Maths) attended the Screening programme for the fourth edition of India International Science Festival 2018 conducted at Haryana Vidya Mandir on 1st August 2018. She has been selected as a participants to demonstrate the innovative approach towards teaching of Mathematics in (IISF) which will be held from 5th October to 8th October at Indira Gandhi Pratishthan, Lucknow. 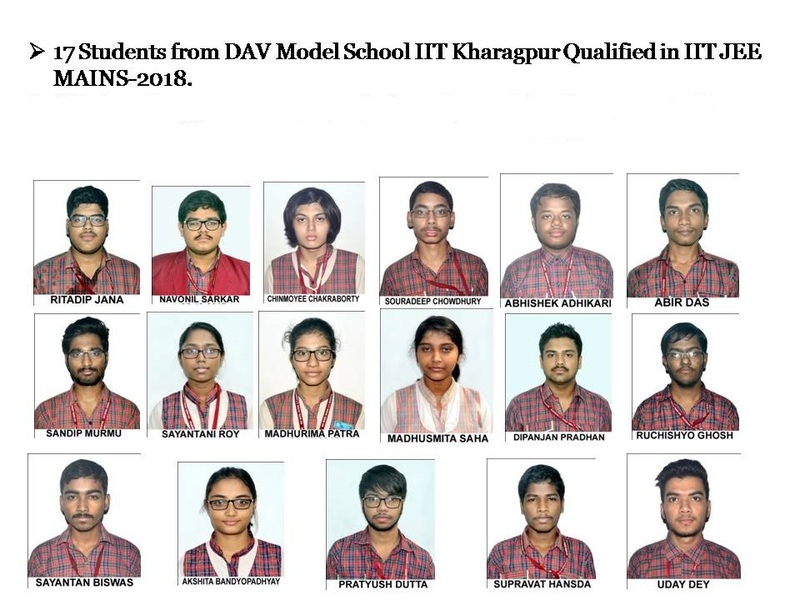 DAV MODEL SCHOOL, IIT KHARAGPUR feels proud to inform that 8 students have qualified in PRMO exam organized by MTA (Mathematics Teachers’ Association) with assistance from IAPT. These students are eligible to appear in RMO 2018. Seven students are among the top 300 in West Bengal region (classes 8 to 11 category)and one of the student is among the top 60 (class 12 category)in West Bengal Region. The school administration, Principal Dr. Sweta Malani and teachers congratulate the students for their best efforts and their achievement. National Educational Day which is an annual observance in India to commemorate the birth anniversary of Maulana Abul Kalam Azad, the first Education Minister of independent India, was celebrated on 12 th November 2018, by the students of DAV Model School, IIT Kharagpur. Priyangshu Saha, Arkaprabha Biswas and Abhishek Sen Sarma is shortlisted in the first round of INSPIRE Awards 2018 from our school. VVM State Level Camp was held on 20th January 2019 at Jadavpur Central Glass and Ceramic Research Institute. Montro Saha of class VI got 3rd position and received Certificate, Memento. He also received a Cash prize of Rs. 2000/-. Commerce Olympiad was held on 16th November 2018 at DAV Model School, IIT Kharagpur. Abhishek Chandra of class XI Commerce has qualified the examination and will be getting Excellence & merit certificates along with trophy from CTF, an ISO Certified Organization. Bhajan competition conducted by Akhil Bhartiya Vedic Sangeet Goshthi was held from 26th to 28th February 2019 in New Delhi. 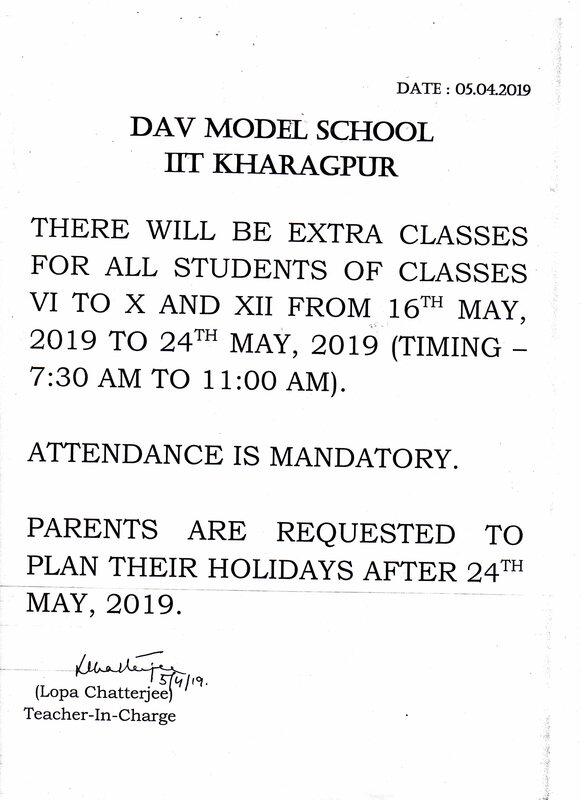 Notice regarding extra classes from VI to X and XII from 16.05.19 to 24.05.19. List of Notebooks from Classes III to XII. Brief orientation of the parents of UKG (New Admission,19-20 ONLY) will be held on Saturday, 30th March,2019 from 8 am sharp in conference hall, DAV Model School, IIT Kharagpur. Brief orientation of the parents of LKG will be held on Saturday, 30th March,2019 from 8 am sharp in conference hall, DAV Model School, IIT Kharagpur. Information regarding the commencement of the New Academic Session 2019-20 for Classes LKG to V.
Information regarding DAV CMC textbook distribution of classes VII & VIII for session 2019-20. Information regarding Report Card Distribution of Class VIII Annual Exam 18-19. Information regarding DAV CMC textbook distribution of classes V & VI for session 2019-20. Answer Sheets of Annual Exam 2018-19 of Class VIII will be shown on 16.03.2019 from 8 am to 8:30 am in the following rooms. Information regarding DAVCMC textbook distribution from classes LKG to II. Parents whose children are appearing for AISSE (X) and AISSCE (XII) 2019 are requested to go through the letter addressed to parents through CBSE very carefully and also ensure that your child follow it. A step towards a Clean and Green Environment : Say 'NO' to Plastic. Reporting time of the students from LKG to XII will remain the same till further notice. A unique interaction of students, parents and teachers with Hon’ble Prime Minister, Shri Narendra Modi will be held at 11:00 am on January 29, 2019 at Talkatora Stadium, New Delhi. Please find the attachment for more details. School has made following changes in the date sheet of Class XI Practical Examination. PTM for classes III to XII will be held tomorrow Friday, 21st December 2018 in school premises. However classes from LKG to XII will remain suspended ON 21.12.2018 for students on account of "Annual Sports Meet 2018-19"
Date Sheet for Post Mid Term Examination 2018. Date Sheet for 2nd Pre Board Examination 2018. Date Sheet for Class Test II 2018 . Date Sheet for 1st Pre Board Examination 2018. NSO Exam 2018 will be held on 15th November 2018 (Thursday). Time : In School timing. It is hereby informed that tomorrow (26.10.2018) for std. III to XII classes will be conducted up to 6th period. Dispersal will be at 11:35 A. M.
From LKG to Std. II, classes will be conducted at as usual timing. i) Classes will be suspended for LKG to Class II . ii) Study leave for Mid-Term Exam for classes III to VIII . Internal Complaints Committee for Prevention of Sexual Harassment And Cyber Crime. Traffic Circulation during School hours in IIT Kharagpur Campus. Admissions open for Class XI (Science, Arts & Commerce) Session 2018-19. Last date for admission and registration is 1st June, 2018 (Friday). Young Reporters For Change Makers.Click below to participate. All the students of Class X and XII of DAV Model School IIT Kharagpur, those who have passed AISSE(Session 1999-2000 onwards) and AISSCE(Session 2005-2006 onwards) are hereby informed that registration is open for DAV Alumnus. Please click here to register. The date of Alumni meet will be informed later. Students and teachers are requested to submit their articles for the School Magazine "Dishari" for the session 2018-19. Please refer to the attached document for the names of the respective in-charges and their e-mail ids. Hindi, Bengali and Sanskrit articles are to be submitted in hard copy to the respective in-charges after the summer vacation. Summer Holiday Homework , Session 2018-19 for Classes LKG- XII. Format of leave application for students. List of Holidays for the Academic Session 2018-19. Books recommended for the session 2018-19. Parents are hereby informed that they are free to purchase School Uniform/ House Uniform from any vendor, but it should meet the school specifications. 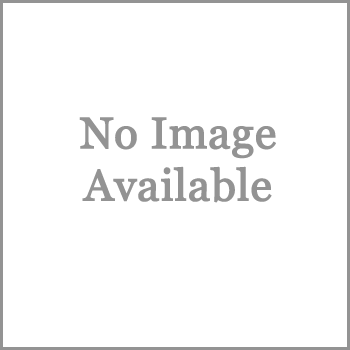 The School does not have any authorized vendor of its own. Visiting Time to Principal ( for parents ) with prior appointment every working day from 9.30 a.m. to 11.30 a.m.